December 13, 2016 – Beleaguered by the fallout of her government’s sale of Hydro One and under pressure from the Ontario auditor general for not spending the proceeds of that sale in the most effective way possible – Premier Kathleen Wynne’s job performance approval among Ontarians has dropped to 16 per cent. This represents an all-time low based on same-source data tracked by the Angus Reid Institute since her February 2013 swearing-in as premier, and a four-point drop since September, largely driven by a deeply unpopular decision to sell the provincial utility. This move has prompted a lawsuit from the Canadian Union of Public Employees seeking to stop the sale of more shares. The Ontario Liberal government, in turn, contends that share sales will pay down the province’s massive deficit. Wynne remains – for another quarter – Canada’s least-approved-of premier, but it is Nova Scotia Premier Stephen McNeil who experiences the largest drop in job approval over the past three months: from 38 to 31 per cent. Much of this is attributable to an ongoing labour dispute with teachers and a controversial decision by the government to close schools on Monday, Dec. 5, after the Nova Scotia Teachers Union directed teachers and staff to operate under a work-to-rule protocol. Among premiers with a greater share of confidence from their constituents when it comes to the job they are doing? Saskatchewan’s Brad Wall and Manitoba’s Brian Pallister. Wall has the approval of nearly six-in-ten people in his province (58%). This measure is statistically unchanged from last quarter. Wall – who has opposed the federal government’s plans to impose a tax on carbon emissions out of fears such a tax will damage the Saskatchewan economy, remains the most popular premier in the country. More people also approve than disapprove of the job Pallister is doing. The Manitoba premier is down three points to 50 per cent since the last quarter, but still ahead of where he was when he took office in the spring (46%). Though his approval levels lag far behind his colleagues on the prairies, New Brunswick Premier Brian Gallant also sees a five-point uptick in approval, to just under three-in-ten (29%). He recently expressed concern about the impact of a Donald Trump administration on his province, which relies on the US for 92 per cent of exports. Gallant also enters 2017 with the Energy East pipeline project in mind. If approved, the project would one day bring oil through Quebec to a terminus point in Saint John. That said, as 2016 draws to a close, most premiers find their approval ratings relatively stable as somewhat cynical provincial electorates leave neither candy nor coal in the stockings of their provincial leaders. In British Columbia, Premier Christy Clark finds herself Canada’s third-most popular premier – albeit a distant third. With fewer than six months to a provincial election in May 2017, the political stakes begin to be raised on such high-profile issues as Kinder Morgan’s TransMountain pipeline twinning and an opioid crisis that is raising alarm and taking lives on the West Coast. Clark maintains the approval of just over one-in-three (35%) people in BC, statistically unchanged since September (34%). One province over, Alberta’s Rachel Notley sees her job performance also unchanged at about one-in-three (31%). While the B.C. electorate is more volatile and in some regions vociferously opposed to the pipeline project, recent federal approval for TransMountain’s twinning may ultimately act as a boon for Notley, as she continues to be plagued politically by grave economic woes in her province and a unite-the-right movement that appears to be gaining steam. In Quebec – the provincial Liberals recently saw their party’s overall share of the popular vote drop in four by-elections with less than a year until general elections in that province next fall. But overall, the results of these votes will have little impact on the makeup of its legislature. Not much has changed for Quebec Premier Philippe Couillard either. His job performance approval remains essentially unchanged – up two points from September (30%). Finally, Dwight Ball’s approval remains static. Ball, who has said his biggest regret the past year was having to break promises, sees his approval numbers continue to stall. 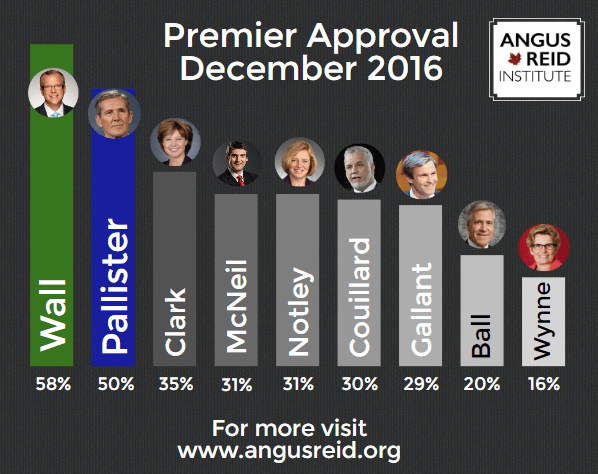 Next to Wynne, Ball is the second least-approved-of provincial premier in Canada, garnering the support of just one-in-five (20%) Newfoundland and Labrador residents. The overdue and over-budget Muskrat Falls hydroelectric project – one that Ball says has put “undue financial strain on our province in a very difficult time” – has added to problems brought by some of the highest levels of unemployment (14.3%) in the country.